“Baby Loves Spanish” Classes: For babies from 6 weeks, crawlers & babies finding their feet. Baby Loves Spanish is a class for Mums, Dads and little ones to learn Spanish together in a fun and engaging way. Familiar nursery rhymes are learnt in both Spanish and English and are accompanied by a variety of fun movements and lovely props to stimulate the senses. The first year of a baby’s life is the best time to introduce a new language and this fun music class allows your child to absorb a second language in a natural, informal way whilst they’re learning English. Our Baby Loves Spanish classes draw on the benefits of baby massage, yoga and sensory stimuli to create a relaxing and enchanting time for parent and baby to enjoy together. Each week we embark on a magical journey and our snuggly puppet characters, lighting effects, appealing props and colourful parachutes will keep your little one engaged from start to finish! “We Sing Spanish” classes: For busy toddlers and pre-schoolers. BilinguaSing (Baby Loves Spanish) is a class for Mums, Dads and little ones to learn Spanish together in a fun and engaging way. Familiar nursery rhymes are learnt in both Spanish and English and are accompanied by a variety of fun movements and lovely props to stimulate the senses! Our “We Sing Spanish” classes are fun-filled, highly interactive classes for busy toddlers and pre-schoolers. Your little one will start to respond to the songs in a more active way, performing actions themselves and interacting with the props with greater control as their motor skills develop. These classes are all about building your little one’s confidence with music and language as well as focusing on their physical and emotional development. The class nurtures a lifetime of language-learning through music and play. Classes are £6.50 for non-members. Become a member and get a fabulous bilingual CDs, a hardback, wonderfully illustrated bilingual book & class discount. 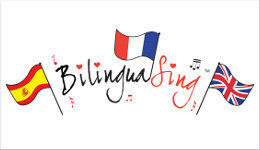 Book your classes or your free taster session on the BilinguaSing website or contact Caireen (caireen@bilinguasing) / 07884 113601 for further information. * Are you looking for a fun and stimulating class to enjoy with your new baby? * Would you like a small, sociable class where you can make new mummy friends? * What about a class with a difference where you can learn something new as well? BilinguaSing baby classes are aimed specifically at new-born babies (from a month old) and non-walking babies. During our sessions we sing well known nursery rhymes in English and Spanish (don’t let that put you off - most mummies don’t speak any Spanish when they start) while also having lots of fun with puppets, sensory play, musical instruments, baby massage, light shows, bubbles and a whole host more. Summer Term Offer: As mummies ourselves, we understand how hard it is to get out and about during those first weeks and that no day is ever the same. We’re therefore offering a limited number of free spaces in our Baby Loves Spanish classes for babies under 12 weeks. Places are limited in each group so please book or get in contact now to avoid disappointment. Although in the UK we've already celebrated World Book Day, in other countries, it's celebrated today on William Shakespeare's birthday! You can never have enough excuses to grab some books and a comfy spot with your little one and ignite their passions for literacy. Did the Easter bunny bring a treat (or two) for your little one? Do you give your child an alternative to chocolate? In Spain, along with chocolate treats, they will be eating traditional torrijas. Delicious! Here's a piccie of the ones we made last year - they definitely tasted better than they looked!!! Palm Sunday in Spain signifies the start of Holy Week (Semana Santa) which is the biggest religious celebration of the year. The family-centred processions and fiestas are absolutely stunning and not to be missed! The British Council's Tracey Chapelton explains how parents of young children can lay the foundations for success. If you are looking for a reason (or two) to teach your child a second language we have you covered. Fancy trying out one of our classes? Come along for a free taster session.